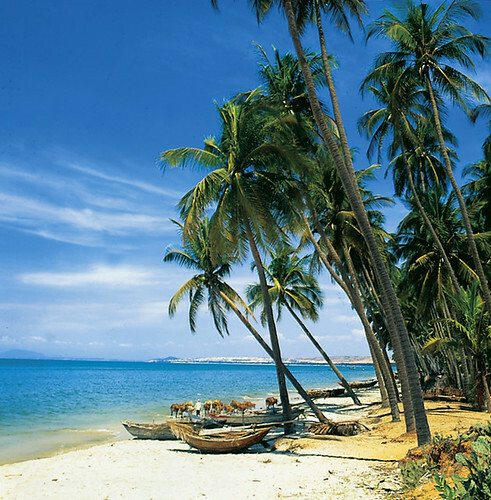 Phu Quoc Island, Vietnam — my outdated Vietnam guidebook devoted a scant two columns on its last page to obscure Phu Quoc Island, but it was enough to assure me that it was the perfect place to put up my feet and do nothing after 10 days of cycling around the country. 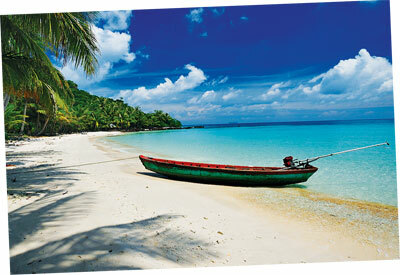 Phu Quoc, less than an hour's flight from Ho Chi Minh City - formerly Saigon - is just 15 miles off the coast of Cambodia. A teardrop-shaped island roughly the size of Singapore, it was a surprisingly untrammeled gem that reminded me of Thailand's Phuket and Koh Samui in the 1970s, before they were besieged by development. Blanketed with the largest remaining swath of tropical rain forest in Vietnam and trimmed in sandy beaches, it is home to only 75,000 people. A battered taxi picked me up in a blast of tropical heat outside the airport, which was almost in the center of the main city, the tiny fishing village of Duong Dong. We headed 5 miles north to secluded Ong Lang Beach over a spectacular potholed road. When we bumped through an old mango plantation and arrived at a string of beachside bungalows amid palms and banyan trees, I knew I'd found the epicenter of tropical idleness. Mango Bay is a laid back eco-resort. My rammed earth bungalow was naturally cool - and rustic but stylish: white cotton, wicker and terra-cotta. Breakfast was high-octane Vietnamese espresso and baguettes with jam - a legacy of French colonialism - and the open-air restaurant/bar tempted at lunch and dinner with waft scents of sautéed garlic and a blackboard menu promising marinated and grilled black kingfish and green papaya salad with shrimp. Ong Lang Beach is great for honeymooners and travelers looking for seclusion, but for more action - though not much more - the island's main attraction is Long Beach, 17 uninterrupted miles of white sand. There is one sizable two-star resort called Saigon Phu Quoc that clearly focuses on the tour bus set, and a chic new five-star resort called La Veranda. Otherwise, a dozen or so signs point down narrow lanes through tropical bush to guesthouses, cottages and bar/cafés. On the palm-lined beach, a few sunbathers splayed on towels were being attended to by a clan of masseuses who stroll the strand. No touts, no crowds, just beachside cafes where you dine on world-class seafood for $10 a couple. It's something akin to a miracle that one of Asia's most beautiful beaches still exists so untouched within an hour's flight of a metropolis of 7 million.